Can anyone ever have enough cookbooks? I’m sure O. would be ready for lively discussion on that topic (ok I do have a few…), but after all he almost enjoys them as much as I do. Whilst following my daily blog reading routine I came across a post (Mango Crème brûlée) on Petra’s blog, which sounded delicious and referenced The Cinnamon Club Cookbook from Iqbal Wahhab & Vivek Singh. I remembered that I put this book on my amazon-wishlist sometime ago, so I went back there. Click-happy as I am, I saw, read and bought it :) Since I purchased it via marketplace, it took a little longer than usual orders – almost two weeks until the sight of a big brown parcel in our real mailbox saved my day… Is there anything better, than coming home after a stressful day of work, finding new evening literature in your mailbox? It has already become one of my favorite Indian cookbooks. Beautiful layout and photography. The recipes seem easy to follow and it has neat writing/little stories besides the recipes. Skimming through the book, the Seared Tuna instantly jumped at me. Not literally of course, but it displaced all other dishes we had on our list (to soon cook) to second and third places. Also, because we just bought tamarind paste on a recent shopping spree. For the dip: Chop the fresh coriander, parsley and spring onions and mix it with the Greek yoghurt – or simply blend everything together in a food processor. Salt to taste. Keep refrigerated until served. 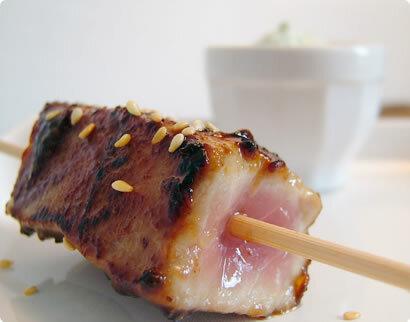 Cut the tuna in little cubes, about 3cm in length, and put them on wooden skewers. Meanwhile briefly roast the seeds (they should not get burned), crush in a mortar and add to the tamarind paste. Also add the oil. Coat the tuna pieces thoroughly with the tamarind paste and cook either under very hot grill for about a minute, turn over for another minute – or sear alternatively in a hot non stick pan until the outside is nicely caramelized while the inside is still uncooked and pink. We tried the grill in the oven – it didn’t work. The tuna turned in an unhandsome grey THING, not very much alike the photo in the book. They suggest a very hot grill – which we thought we had in our kitchen. Talking about heat, looks like Indian tandoors play in a whole different league :) However, the pan we tried instead worked just fine, the results looked glossy and convincing and so they tasted. Required time: less than 30 min. Your entries are always so beautiful! Where did you buy the tuna? That seared tuna does look Delicious. I will almost certainly try the recipe one of these spring Days. I just wanted to say that THERE IS NO SUCH THING AS TOO MANY COOKBOOKS!! Sorry, did I get quite loud there? Didn't mean to - but really, there isn't, we ALL know that! ;-P The tuna looks delish! I bought the tuna at Poseidon (Westenriederstr.13) - a good fishmonger near Viktualienmarkt. You can also try "Fisch Witte", located at Viktualienmarkt. By accident we once spotted a well-known German cook shopping for fish there - maybe additional evidence for their good quality. just visited your site - the description of your "Final Menu" looks/sounds absolutely divine! How on earth did you get each of those innumerable courses done AND made them look just perfect? Wow! Hi, I just wanted to say that I love your blog, not only is it very pretty but I really appreciate how detailed you are with the recipes. I tried the chocolate cake for my flatmate's birthday, and it was a huge success. Today is my birthday and my colleagues have given me a €50 Amazon voucher. I would love to spend it on cookbooks, but unfortunately there's so many that I want that I just can't choose (yes, like so many of you out there I too am a cookbook addict). Could you give me a recommendation? Thanks for your moral support on the cookbook issue ;) Great new arguments there, “an investment in a culinary education” sounds hilarious!